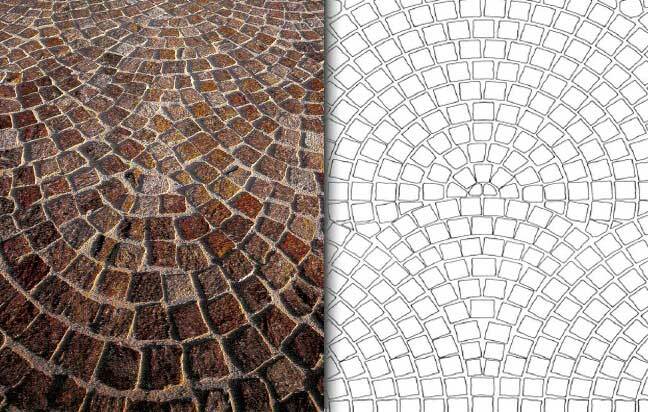 Porphyry paving cubes for use in a pattern of overlapping arcs is one of the oldest designs for stone pavement. It has continued in use for centuries due to its stability, beauty and pleasing intricacy. In Europe, one of the more popular layouts is the bogen also known as an overlapping arc, which is often mistaken for a fan but is actually a series of stacked arcs. The bogen layout is complex and requires the skills of an experienced artisan as the setts at the ends of the arcs, where one arc meets its neighbor, need to be somewhat smaller than those in the center of each arc. Traditionally, bogens are incredibly strong layouts as the arcs work to dissipate forces over a much larger area. Their development and use reached a peak when horse-drawn traffic dominated the streets, but since the advent of modern vehicles, their use has been increasingly one of aesthetics. They remain popular in continental Europe, Britain and Ireland as the availability of porphyry cubes and granite setts has increased. This video was posted by Stephen Murray-Cook showing the Original Stone Paving Company laying a courtyard in the overlapping arc pattern. They are using some very efficient aids in their laying. Please watch this 3 minute video to see this in time lapse. Street mason Stephen Cook (known as Cookie) understands stone, the 52 year old has been working with it since he was 15 years old. As a craftsmen whose reputation depends on the quality of his workmanship, he refuses to use inferior materials. Stone looks good for decades. “That’s why we use it” says Cookie. We source a wide range of high qualify stone from around the world to offer the discerning customer a wide variety of choice. We offer a complete package from supply to completion, our service includes all associated groundwork drainage and brickwork. Cookie has more than 35 years experience in quality workmanship working with both new and reclaimed materials and has completed projects at the Houses Of Parliament, Clarance House and Edinburgh’s Royal Mile.